Keating, J. et al. "Silver". The Canadian Encyclopedia, 23 June 2016, Historica Canada. https://www.thecanadianencyclopedia.ca/en/article/silver. Accessed 26 April 2019. Important producing countries now are Mexico, Peru, the Commonwealth of Independent States, the US, Canada, Australia, Chile, Poland and China. Photographic films and papers account for about 25% of the demand for silver. Rock cut at the Foster Mine, Cobalt, Ontario, 1905 (courtesy Northern Miner Press). 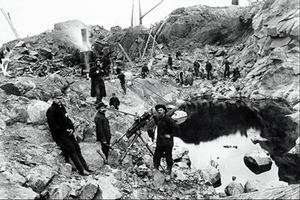 At Silver Lake Mine, Ontario, circa 1890 (photo by H.N. Topely, courtesy Library and Archives Canada/PA-50947). Silver (Ag) is a metallic element with brilliant white lustre and a melting point of 962°C. It has the highest electrical and thermal conductivities of all metals and, although tarnished by sulphur, is relatively corrosion-resistant. Silver is second to gold in malleability and ductility, being easily rolled or beaten into foil or drawn into fine wire. Its use for ornaments and utensils predates recorded history. 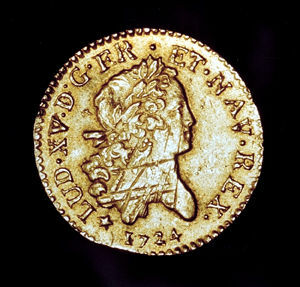 Silver has been an important medium of exchange since very early times. Mines in the eastern Mediterranean and Spain were early sources, but the centre of production had moved to the western hemisphere by the 16th century. Important producing countries now are Mexico, Peru, the Commonwealth of Independent States, the US, Canada, Australia, Chile, Poland and China. Photographic films and papers account for about 25% of the demand for silver. Industrial use, jewellery and silverware represent about 70% of fabrication demand. Industrial use includes electrical and electronic, eletrodeposition, mirrors and coatings, batteries, catalyst and water purification systems. Silver use in silverware is mostly in jewellery and works of art, as sterling silver (92.5% silver, 7.5% copper) and for silver plating. The use of silver in coinage is now largely confined to numismatic coins and medallions, although Mexico began to use silver in the production of 10, 20 and 50 peso coins for general circulation in 1993 (see Minting; Coinage). Silver is recovered from mined ores and recycled materials such as film, electronic devices, industrial wastes, silverware and jewellery. Approximately 20% of the silver produced annually is from recycled materials. Some silver is recovered from ores mined principally for the silver content, eg, around Coeur d'Alene, Idaho, and Mexico. However, about 85% of mine supply is a by-product of treating lead-zinc-copper and gold ores. The main producing areas in Canada are BC, New Brunswick, Ontario and Québec. Canada produces over 1000 t of silver annually. Ores at primary silver mines are concentrated by gravity and flotation, and the silver recovered by cyanidation or pyrometallurgy (see Metallurgy). Silver occurring in base-metal ores follows these metals in concentrating and smelting processes, ends up in residues and is recovered by electrolysis.